William Shakespeare's "Macbeth" as adapted by Giuseppe Verdi continues to defy accusations of being trivialized and simplified. The LA Opera presentation of the loveless opera starring Placido Domingo as Macbeth and Ekaterina Semenchuk as Lady Macbeth with direction by the Tony Award-winner Darko Tresnjak, remains as one of opera's most important works because "is it not a series of formulaic scenes designed to showcase the vocal prowess of the performers, but because it is a concentrated distillance of the dramatic essence." The libretto by Francesco Maria Piave and Andrea Maffei was made significant by Verdi's masterful music and his comprehension of the dramatic credibility on the acting required of the singers in his revised 1865 opera. 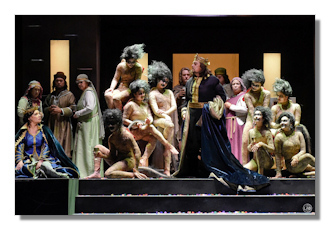 With immaculate conducting by LA Opera's Music Director James Conlon, the four- act tragedy loomed large over a period of three hours. The music, singing and acting in each scene, from the planning of Duncan's murder by Macbeth and his wife, to the finale and the crowning of Malcolm, played by Josh Weeker, was consistent with Verdi's musico-dramatic genius. Placido Domingo's dramatic baritone instinctively captivated the capacity audience with each aria. From his first big piece during which he and Lady Macbeth plan Duncan's murder (Mi si affaccia un pugnal? / "Is this a dagger which I see before me? "), to his final aria ("Perfidi! All'anglo contro me v'unite! … Pietà, rispetto, amore") wherein he contemplates that he is already hated and feared, his voice was strong, sinister, regretful, ruthless, and embodied all of the characteristics his role demanded with fierce determination and virtuosity. Domingo's exceptional approach to the pathos indicative of Macbeth's sorrow at his murder of the king and to Macbeth's hardened malevolent qualities was met with an ecstatic, profound ovation that aimed to match the musical and dramatic power Domingo projected from the stage. Lady Macbeth's arias were bold and brilliant, challenging and relentless. Ekaterina Semenchuk's soprano coloratura amplified her character's power-hungry and psychological subtleties as a conniving murderess (La luce langue and O voluttà del soglio – the cabaletta for La luce langue – where she revels in the joy of Macbeth's decision to murder Duncan. She continues her fierce determination to ascend to the royal throne, chastising Macbeth for his sorrow and fear of the apparitions at the banquet. She insists her guests remain happy during her wine song (Si colmi il calice di vino). However her ascent to power is not without retribution as she descends into mental anguish during the sleepwalking scene where she is unable to wash the imagined blood of her victims from her hands ("Una macchia è qui tuttora!) Here, her dramatic coloratura is muted but convincing and elicited a roaring ovation from the audience. The entire company provided a solid foundation for Darko Tresnjak's superb directorial approach. The choral direction by Grant Gershon, the remarkable climbing by the witches, the co-scenic designers' sets, the costumes by Suttirat Anne Larlarb and lighting designed by Matthew Richards, brilliantly enhanced the performances and singing. The creative team supporting "Macbeth" as a whole speaks volumes about their deep commitment to the all-new majestic staging of Verdi's thrilling adaptation of Shakespeare's classic.